Members of Waverley Dowsers and their guests gathered at the Tunsgate Arch in Guildford to explore the stories behind some of the hauntings in the town Centre. The session was lead by Celia Woodward, and was definitely not a ghost-busting exercise, though we begin by putting psychic protection in place just in case we disturbed any lurking entities. We took as our starting point three cases described in Philip Hutchinson’s book “Haunted Guildford” and looked to see what additional information we could discover about the events leading up to the reputed hauntings. In the course of the evening we practiced several dowsing techniques, including map dowsing to trace Lorna’s route on her way to Jacks Close where she was found fatally injured the morning after a row with her father. We also used pendulums and L-rods to enquire further into the circumstances of that walk. We also explored more of the story leading to the death of Christopher Slaughterford’s young lady which resulted in his being hung for her murder but still protesting his innocence. And to finish off the evening we moved to the High Street outside the Monsoon shop to consider the history of the underground chamber found under these premises in 1995. Pendulums and L-rods were used to work out the dates when this chamber was built, and later filled in, what it was used for, and who was the likely owner. Some of us also used hand dowsing and visualisation techniques. The evening provided opportunities for both beginners and more experienced dowsers to practice various dowsing techniques in an unusual setting. 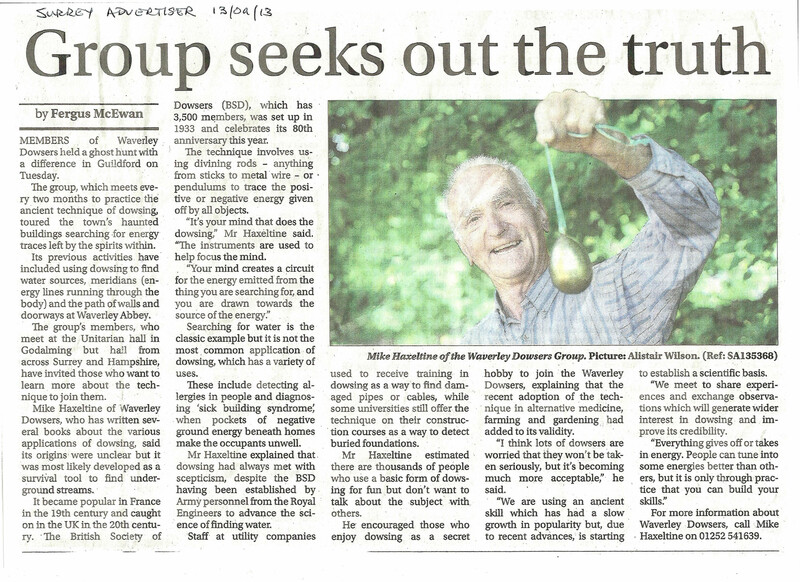 The evening of Ghost hunting was also picked up by the Surrey Advertiser, Surrey’s major local newspaper who printed an article on Dowsing featuring The Waverley Dowsers with some sound bites from Mike Haxeltine who has been active locally promoting the idea of using Dowsing as one of the tools that could be considered when Surrey County Council are surveying areas for Tree planting, Mike has extensive experience with Tree planting while working for the Forestry commission at Alice Holt and he feels that not only could Dowsing reduce the failure rate of the Tree’s that are planted but would also save local tax payers money due to the additional cost of replacing dead Trees, which is in effect double planting costs. You can read the Guildford Advertisers article below by clicking on the image.